As compliance packaging becomes increasingly popular, pharmacy owners are starting to look at dispensing costs -- not in terms of drug wholesale costs, rebates and DIR fees -- but in terms of vials versus blisters, or vials versus pouches. But what about your pharmacy costs, and specifically your dispensing costs -- including labor and materials -- for getting the scripts into the patients’ hands? 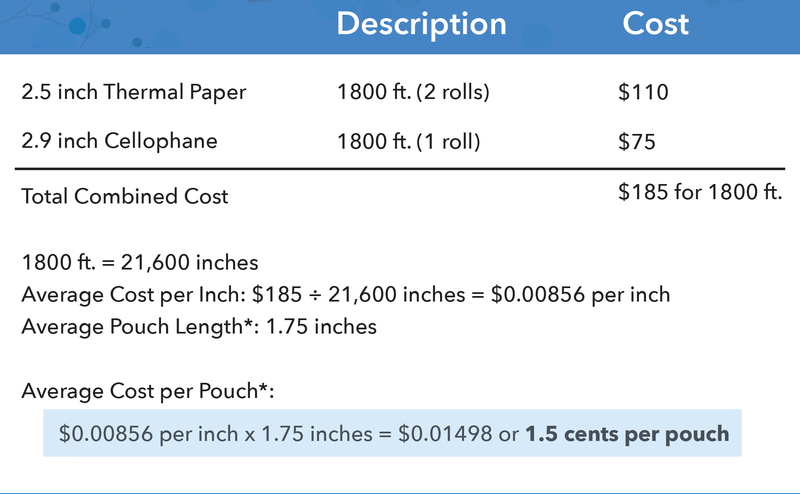 Regular readers of our blog may remember we already conducted a deep dive into the cost of strip packaging consumables last year. Consumable costs for our RapidPakRx™ strip packaging system are demonstrably lower than competing systems. See the graphic below. But now, let’s turn our attention to a comparison of those costs with traditional vial filling and blister card packaging. Vial-filled drugs have been the standard in the US for decades. In fact, the first prescription bottles date back to the mid-1800s. In terms of consumable costs, most vials cost an average of 20-25 cents, not including the cap. Vial caps are about a nickel. So, let’s use $0.30 per vial as a ballpark cost. 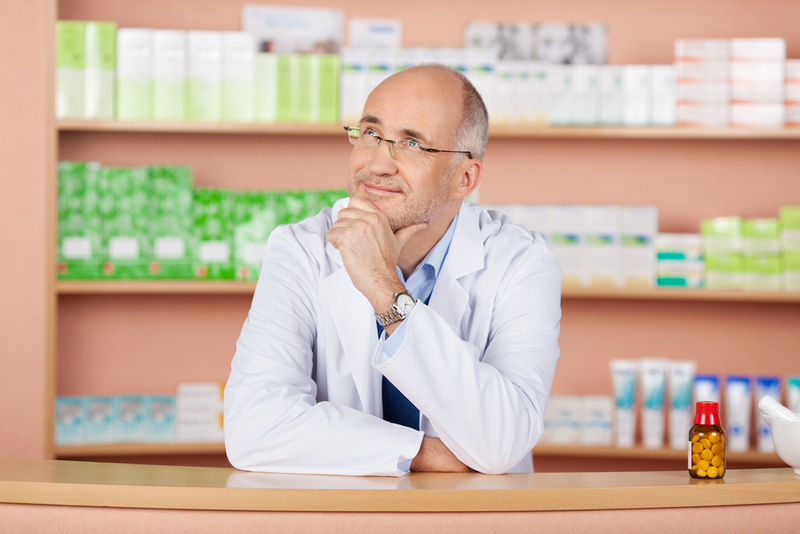 If you filled 7 monthly prescriptions for a patient, the consumable cost would be $2.10. (That’s 7 scripts x 30 cents a vial, including the cap). Based on the chart above, we already know that pouches produced by the RapidPakRx system cost 1.5 cents each. Let’s assume, for a month’s supply of morning-afternoon-evening pouches (3 per day for 30 days), you’re looking at 90 pouches per adherence strip. At $.015 per pouch, that’s $1.35 for 90 pouches. But, we’re not finished. You’ll need a box to hold the rolled-up strip. A PakMyMeds™ box is 69 cents. So, all in, the consumables cost for a month’s supply of strip-packaged meds is $2.04. *Includes box to hold 90 pouches in a strip. In this example, the pharmacy’s expense to fill 7 scripts with strip packaging or vial filling are about the same. Multi-med blister cards are far more expensive. Note, as the number of prescriptions rises, strip packaging begins to become even more economical. For example, in the table below, we’ll remove blister cards and instead examine a patient on 11 medications (this is the average number of patient medications our RapidPakRx customers report that they typically fill in their existing adherence programs). *Includes box to hold 120 pouches in a strip. Note, we increased the number of pouches to 120, allowing that with 11 medications, it’s possible the patient would require 4 pouches per day, instead of three (i.e. breakfast, lunch, dinner and bedtime). Even if you had to add another box to accommodate more pouches, the cost for the completed job would be about the same as vials. RapidPakRx runs 20 “smart” bulk-loaded universal cartridges that dispense any oral solid medications, such as gel caps, half tabs, capsules, tablets, new generics, supplements, vitamins — even OTC medications, etc. — without calibration. And now, for a limited time, customers that purchase a RapidPakRx system will be automatically enrolled in the PakMyMeds Network. PakMyMeds Network is a new, no-hassle solution to connect independent pharmacy owners with local patients who want an easier way to take their medications. Using sophisticated GeoMarketing, online/mobile ad networks and social media, PakMyMeds Network will advertise -- in a 50-mile circle around participating pharmacies -- to patients who could benefit from improved medication adherence and/or are searching for adherence packaging services. Patients who opt-in will then be connected with a partner pharmacy in the PakMyMeds Network. To learn more about the RapidPakRx, visit our product page and schedule a demo with your salesperson, or call now at (877) 960-3236.